Temperature : Max. 35.5°C and Min. 28°C in Summer.Max. 22°C and Min. 7°C in Winter. Best Season : July to March, especially during the monsoon months. 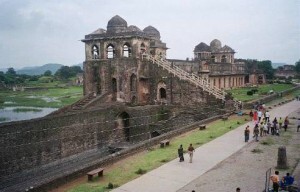 Perched along the Vindhya ranges at an altitude of 2,000 feet, Mandu, with its natural defenses, was originally the fort capital of the Parmar rulers of Malwa. Its rulers built exquisite palaces like the Jahaz and Hindola Mahals, ornamental canals, baths and pavilions, as graceful and refined as those times of peace and plenty. 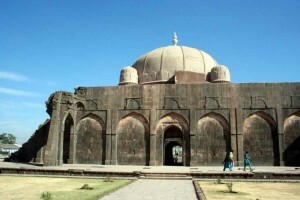 Each of Mandu’s structures is an architectural gem; some are outstanding like the massive Jami Masjid and Hoshang shah’s tomb, which provided inspiration to the master builders of the Taj Mahal centuries later. Mandu is a celebration in stone, of life and joy, of the love of the poet-prince Baz Bahadur of his beautiful consort, Rani Roopmati. The balladeers of Malwa still sing of the romance of these royal lovers, and high up on the crest of a hill. Roopmati’s Pavilion still gazes down at Baz Bahadur’s Palace, a magnificent expression of Afghan architecture. 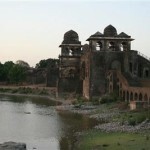 Under Mughal rule, Mandu was a pleasure resort, its lakes and palaces, the scenes of splendid and extravagant festivities. And the glory of Mandu lives on, in legends and songs, chronicled for posterity. Air: Nearest airport is Indore. Rail: Nearest railway station is Indore 99 km, besides Indore another convenient railway station is Ratlam 124 km on the Delhi-Mumbai main line. Road: Mandu is connected by road with Indore 105 km, Ujjain 152 km, Bhopal 292 km, Jabalpur, Khajuraho 679 km, Mumbai 590 km, Ahmedabad 349 km, etc. Regular bus services connect Mandu with Indore, Dhar, Mhow, and Ratlam. Jahaz Mahal: This 120 mts1 long “ship palace” built between the two artificial lakes, Munj Talao and Kapur Talao, is an elegant two-storeyed palace. Probably Sultan Ghiyas-ud-din Khilji built it for his large harem. With its open pavilions, balconies overhanging the water and open terrace, Jahaz Mahal is an imaginative recreation in stone of a royal pleasure craft. Viewed on moonlit nights from the adjoining Taveli Mahal. The silhouette of the building, with the tiny domes and turrets of the pavilion gracefully perched on the terrace, presents an unforgettable spectacle. Hindola Mahal: An audience hall, also belonging to Ghiyas-ud-din’s reign, it derives its name of “Swinging palace” from its sloping sidewalls. Superb and innovative techniques are also evident in its ornamental facade, delicate trelliswork in sandstone and beautifully molded columns. 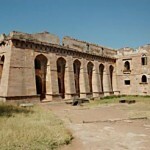 To the West of Hindola Mahal there are several unidentified buildings which still bare traces of they’re past grandeur. Amidst these is an elaborately constructed well called Champa Baoli that is connected with underground vaulted rooms where arrangements for cold and hot water were made. Other places of interest in this enclave are Dilwar Khan’s Mosque, the Nahar Jharokha (tiger balcony), Taveli Mahal, the two large wells called the Ujali(bright) and Andheri(dark) Baolis and Gada Shah’s Shop and House, all worth a visit. Hoshang Shah’s Tomb: India’s first marble edifice, it is one of the most refined examples of Afghan architecture. 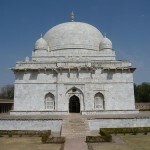 Its unique features are the magnificently proportioned dome; marble latticework of remarkable delicacy and porticoes courts and towers to mark the four corners of the rectangle. 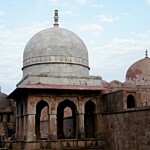 Shah Jehan sent four of his great architects to study the design of and draw inspiration from the Tomb. Among them was Ustad Hamid, who was also associated; with the construction of Taj Mahal. Jami Masjid: Inspired by the great mosque of Damascus, the Jami Masjid was conceived on a grand scale, with a high plinth and a huge domed porch projecting in the centre, the background dominated by similar imposing domes with the intervening space filled up by innumerable domes. The huge proportions and the stern simplicity of its construction strike one. The great court of the mosque is enclosed on all sides by huge colonnades with a rich and pleasing variety in the arrangement of arches, pillars, number of bays, and in the rows of domes above. Ashrafi Mahal: Built by Hoshan Shah’s successor, Mahmud Shah Khilji, this “palace of gold coins” facing the Jami Masjid, was conceived as an academic institution for young boys, and sundry cells still remain in a fair state of preservation. In the same complex he built a seven storeyed tower to celebrate his victory over Rana Khumba of Mewar; of which only one storey has survived. 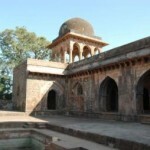 Also in the ruins is the tomb, which was intended to be the largest structure of Mandu. 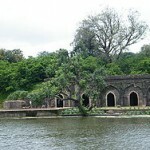 Rewa Kund: A reservoir, built by Baz Bahadur with an aqueduct to provide Roopmati’s palace with water. Today, the pool is revered as a sacred spot. Baz Bahadur’s Palace: Built by Baz Bahadur in the early 16th century, the palace’s unique features are its spacious courtyards surrounded by halls and high terraces, which afford a superb view of the surrounding countryside. 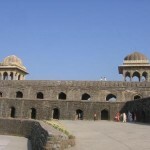 Roopmati’s Pavilion: The pavilion was originally built as an army observation post. From its hilltop perch, this graceful structure with its two pavilions was a retreat of the lovely queen, from where she could see Baz Bahadur’s palace and the Narmada flowing through the Nimar plains far below. Nilkanth Monuments: This sacred Shiva shrine is sited in a magnificent setting, at the very edge of a steep gorge. In its tree-shaded courtyard, a stream feeds a sacred pond, and pilgrims still gather to worship here. Nilkanth Mahal: Belonging to the Mughal era and close to the Nilkanth shrine, this palace was constructed by the Mughal governor, Shah Badgan Khan for Emperor Akbar’s Hindu wife. On the walls here are some inscriptions of the time of Akbar referring to the futility of earthly pomp and glory. Hathi Mahal, Darya Khan’s Tomb, Dai ka Mahal, Dai ki Chhotti Behan Ka Mahal, Malik Mughit’s Mosque and Jali Mahal are some of the other fascinating monuments. The Darwazas: The 45 km parapets of walls that encircle Mandu are punctuated by 12 gateways. Most notable of these is Delhi Darwaza, the main entrance to the fortress city, for which the approach is through a series of gateways well fortified with walled enclosures and strengthened by bastions such as the Alamgir and Bhangi Darwaza, through which the present road passes. 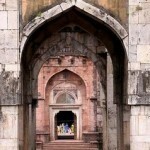 Rampol Darwaza, Jehangir Gate and Tarapur Gate are some of the other main gateways. 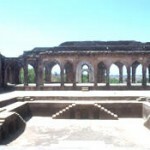 This entry was posted in Madhya Pradesh, Mandu and tagged Ashrafi Mahal, Baz Bahadur’s Palace, Hindola Mahal, history of mandu, Hoshang Shah’s Tomb, Jahaz Mahal, Jami Masjid, mandu india, mandu map, mp tourism mandu, Nilkanth Mahal, Nilkanth Monuments, Rewa Kund, Roopmati’s Pavilion, The Darwazas. Bookmark the permalink.